I wasn’t sure what size to get when I ordered this bra, so I went with 65G, because in worst case scenario, I could use extenders if the band was too tight. The band is firm. When I first wore this, I wore it with an extender, and it felt fine. I have it in right now without an extender, and it also feels fine. I definitely didn’t loose weight, so I’m not sure why I had an extender on the first time. The lace part of the band (in the front) doesn’t stretch at all. There is elastic at the very bottom of the longline, which (on me) can have the potential to feel too tight. There’s no boning on this longline, so there won’t be anything stabbing you in your ribs, however the fabric does get a little wrinkly. On me, where the lace meets the solid fabric, at the bottom of the band it tends to press into my skin. I’m short, and the longline comes down to where my waist tapers in, it probably won’t look as long on someone that is taller. The cups have good depth at the bottom. This longline isn’t like the padded longlines, in which the bottom is shallow. I don’t know if this is because the bra is unlined, or because the fabric that makes up the gore is non stretchy. I requested that the cup be reduced 1cm only, I’m not sure if that was done, as the cup height is 5.75 cm. The cup does seem higher than what I want it to be, but it’s not too tall. 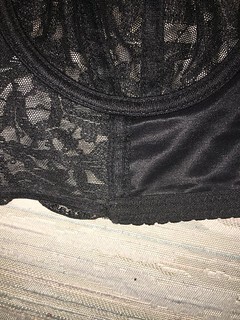 There is some stitching at the top of the bra, and even though it’s not elastic, it doesn’t seem to make the bra closed on top. There’s 2 layers of fabric on the cups, but it’s still sheer. I believe the fabric is exactly the same as the fabric on the coco bra. The width of the cup is 5.25 inches, and the depth is 8.4 inches. Lately with unlined bras I need a depth of around 9 inches, but I think this works because there’s enough depth at the bottom and it’s open enough at the top. I can’t get an accurate measurement for what the gore is (since it’s a longline), but it seems like it comes up higher on my sternum, than other bras. The gore isn’t stabby. I did request that the gore be narrowed, so that could be helping with the cups not feeling too widely spaced. 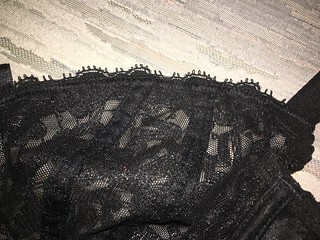 I think a narrowed gore is an alteration I need to ask for with Comexim, as sometimes the bottom of the gore is too wide. I think I requested that the straps be moved in 1 cm. I don’t need them to be moved in 2 cm, but on my Donna bra the straps feel like they could be moved in a bit. 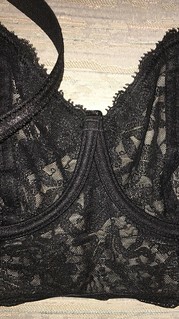 The straps on this bra are the same as the ones on pretty much all the bras with black straps (Rose, Donna, Tropical Garden, Coco, Burgundy, Mystic etc); they’re not the easiest to adjust. They’re not like other straps where you can adjust them while wearing the bra. You can see how long this longline is on my short torso. This is how I wish all longlines were. I’m very happy that the lace front part of the band of this bra isn’t stretchy. Because this stretchy part is probably a reason why Comexim longline bras aren’t so comfortable as other longline bras for me. Probably I should try this bra, moreover when the cups aren’t padded. There aren’t many non-padded longline bras. That is a gorgeous bra, and such great shaping, too! I really like the way this longline looks on you. I’m always wishing longlines were longer. It’d be great if they all reached the waist and were boning-free, like Bellissima. The gore does look higher than on a lot of your other bras. I’m sure it would be too high on me because my breasts have a ridiculous absence of space between them. They have separation anxiety, lol. I love the overlapping wire channels in your Bellissima’s gore, though. Good call to request a narrowed gore. Overall I’m very impressed by the sophisticated look of Bellissima. I hope they do a very that’s cut like Wellfitting’s Extra Deep Plunge bras, but with that very long longline part.